Helen Obando (left), 13, rested during Pop Warner cheerleading practice at Lawrence High School. Fourth in a series of occasional articles on people contending with chronic pain. Sydney is 13 years old, and pain is her daily companion. It’s common to think of pain as an adult burden, the product of time-beaten joints and aged tissues, but pain also hobbles children. When that happens, youngsters’ suffering is often overlooked or dismissed. Or it gets chalked up to psychological issues — an approach especially troubling to some parents. Among childhood pain syndromes, sickle cell disease stands out as an especially bedeviling condition. Gottschalk experienced the price of such neglect when his teenage son developed chronic pain after a knee injury. Even though he is a well-connected pediatrician, Gottschalk couldn’t find help in the Houston area. His hospital’s pain center focused on short-term problems, and the local chronic pain specialists would see only adults. Gottschalk and his son ended up traveling to Boston for treatment. But even for those who live in Boston, there’s no guarantee of good care. Johann Marin spent much of his childhood hunched over his desk at school, feeling like barbed wire was wrapped around his muscles. A doctor accused him of faking it to get out of schoolwork. His teachers ignored him. Not until he was 20 did Marin get referred to the outpatient pain clinic at Boston Children’s Hospital, where he learned coping techniques and received medication to ease his problem, diagnosed as fibromyalgia. Now 23, he just graduated from high school, will start college in January, and plans to become a doctor. As recently as the 1980s, doctors sometimes operated on infants without anesthesia, believing they didn’t feel pain, or would forget it in any case. Research has since shown that the nerves don’t forget, and early pain leads to sensitivity years later. Still, recent federal guidelines on opioid prescribing address only adults, and the Institute of Medicine’s 2011 report on pain devoted exactly two of 364 pages to children. Sydney Durlach squeezed putty as a distraction from her pain during an appointment at Emerson Hospital. Chronic pain in children can affect the abdomen, back, muscles, or joints — and often strikes more than one part of the body. Headaches are common. Sometimes, the pain springs from a condition such as arthritis. Other times, the pain itself is the illness, the result of a nervous system gone rogue. Girls are affected much more often than boys. Dr. Neil Schechter, director of the Chronic Pain Clinic at Boston Children’s Hospital, said physicians today do a good job managing children’s pain from surgery and injury. But chronic pain poses complex challenges, he said. It requires a lot of doctors’ time and intense collaboration among specialists — both tall orders for today’s frenzied, fragmented health care system. Children’s pain is also complicated by family dynamics and psychological factors. Its intensity can rise or fall based on how children think about the pain, and how their parents react. Fear makes pain worse, and so does stress; relaxation and distraction can ease it. Parents’ reasonable efforts to protect their children can make matters worse. Kids stay home from school, stop playing sports, let friendships lapse. Inactivity and isolation worsen symptoms — as does the constant fretting that a dangerous physical abnormality is at fault. Sydney Durlach, the Concord girl injured at soccer practice, also had her share of imaging studies, all showing nothing wrong with her foot’s anatomy. Instead, as she learned a month after her accident, she has complex regional pain syndrome, a condition in which the nerves continue to send pain signals to the brain after an injury has healed. Pain, originally the body’s warning to protect a damaged limb, had now become an illness of its own. Sydney could not bear to put her foot on the ground. In the shower, she sat on a stool and draped her leg outside, protecting her sensitive skin from the water’s battering. Her mother drove her to school every day, helping her out of the car and into the building, where she hobbled around on crutches. Her right calf shrank to a stick, the muscle atrophied from disuse. Sydney was referred to the Mayo Family Pediatric Pain Rehabilitation Center, a treatment program in Waltham run by Boston Children’s Hospital. After months on the waiting list, she was admitted in June. There she joined five other children, mostly girls, who came every weekday from 8 a.m. to 4 p.m., joined by their parents for the last hour of each day. Eleven staff members, including physical and occupational therapists, worked with the children to improve their functioning — making no promises about ending the pain. Sydney needed to learn that her foot had the mechanical ability to bear weight, that pain no longer signaled a damaged joint needing protection. She took it step by step — first practicing letting her foot touch the floor, then putting weight on it, then walking with one crutch. By the end of the third week, she was able to put aside the crutches altogether. For some children, the center prescribes drugs that affect the nervous system, typically anticonvulsants or antidepressants, said Dr. Navil Sethna, clinical director. These drugs are best used short term, he said, because they tend to slow the nervous system, leading to drowsiness and difficulty with thinking and memory. Sydney, however, did not take medications, because her parents were concerned about side effects. Instead, she relied on the coping skills taught by the rehab center’s psychologist, Caitlin Conroy. Sydney squeezed and stretched a ball of putty, as a distraction. She learned breathing techniques to calm herself and keep moving despite the pain. And the staff urged her to think about what she would gain from persevering — being able to enjoy the activities that other kids do. Sydney’s mother, Amy, drove her to a physical therapy appointment. 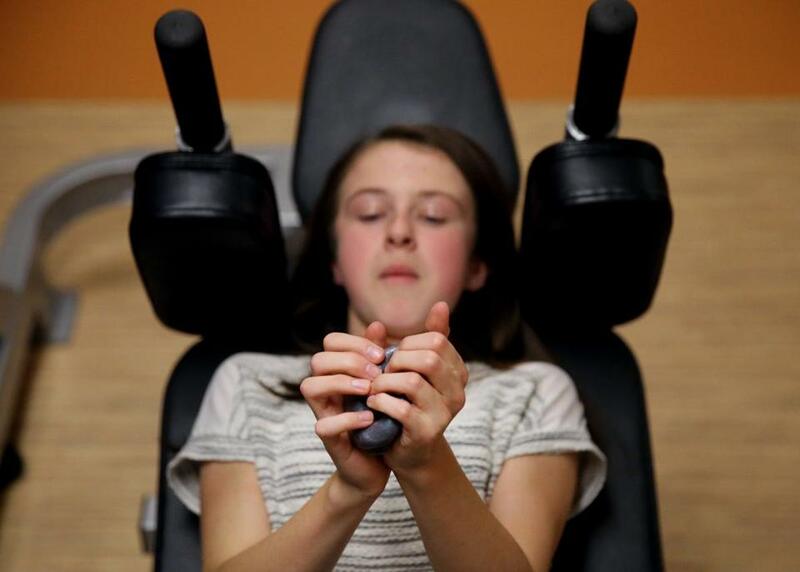 Such coping strategies ultimately “change the physiologic response to pain and decrease nervous system sensitivity,” said Rachael Coakley, a psychologist who heads another outpatient pain program at Boston Children’s. But parents, she said, sometimes wrongly assume that a psychologist’s involvement implies the pain is a psychological problem. Instead, pain involves a complex interplay of mind and body. Dr. F. Wickham Kraemer, medical director of the Acute and Chronic Pain Management Program at Children’s Hospital of Philadelphia, said the “psychological connectedness of mind and body” is especially salient in young people amid the mental and physical stresses of adolescence. Still, he said, doctors keep their eyes open for underlying medical problems, and worry about missing them. In rehab programs, “you push the kid to get through it. That can backfire.” He described such situations as rare. But it’s those situations that worry some parents, who complain that the emphasis on psychology, while important, can risk overshadowing legitimate medical needs. The Coalition Against Pediatric Pain, based in Marshfield, was founded five years ago by parents of children with complex disorders, in the hope of educating doctors and patients. Two of the five founders were parents unhappy with their children’s experiences at Boston Children’s. In the ensuing years, Richards-Stipnieks learned that her daughter, now 16, had an unusually complex set of medical conditions, related to a genetic connective-tissue disorder, Ehlers Danlos syndrome. After leaving the program, Karen had 20 surgeries. Today, she manages her pain and happily takes the train each day to private high school in Boston. Michaela Sullivan also attended the Children’s rehab program at age 13, after she suffered lasting pain from spinal fusion surgery to correct scoliosis. Now 18, she described her experience there as helpful but traumatic. Her pain did not abate, but she did learn to walk again, and was grateful for that. Dr. Pradeep Chopra, who specializes in treating rare and complex pain conditions, said he has seen children in his Pawtucket, R.I., practice who have had similar experiences. “These children, they had been to all the top-notch hospitals, and eventually they were told this was all psychological,” he said. And yet Chopra, who trained at Harvard and serves as a clinical faculty member at Brown University’s medical school, said that in most cases he found objective evidence of a physical disorder. Haylee Obando (left) and her sister Helen, 13, stretched during cheerleader practice. Schechter, the chief of Children’s chronic pain clinic, said doctors always strive to identify the physical source of pain. But at some point, searching for an elusive answer becomes counterproductive, distracting from efforts to improve a child’s life now. Sethna, the rehab center’s clinical director, did not have permission to discuss individual patients. He said all patients entering the program “have been seen by specialists who have ruled out all correctable causes” of their pain. “We are left with patients who have tried everything,” Sethna said. “Do we either help them, in the rehab approach, or have them stay where they are?” Remaining in a wheelchair can cause muscle weakness and joint contraction, and limit a child’s life experiences. Data from Children’s Pediatric Pain Rehabilitation Center, as yet unpublished, show that 85 percent of participants improve significantly and continue to function well months to years after discharge. The 15 percent who don’t improve tend to have chronic medical conditions, Sethna said. Still, since leaving the program, the 13-year-old has had six or seven “pain flare-ups,” a few days when the pain got so bad she would begin limping again. During a recent session at Emerson Hospital’s Center for Rehabilitative and Sports Therapies in Concord, physical therapist Lisa Coppola had Sydney do leg lifts, kick a soccer ball, and balance one-legged on a foam square. During the workout, Sydney often broke into her irresistible smile. Smiling, she said, is one way she copes with pain. Her foot hurts as badly now as it had before going to the Children’s program. But before, she had feared the pain so much she couldn’t use her leg. Now, at Coppola’s request, she balanced her full weight on her right foot, wavering slightly as she chewed gum and furiously mashed the putty. Will Sydney’s pain ever go away? Amy Durlach, Sydney’s mother, said she doesn’t think about whether the pain will end.